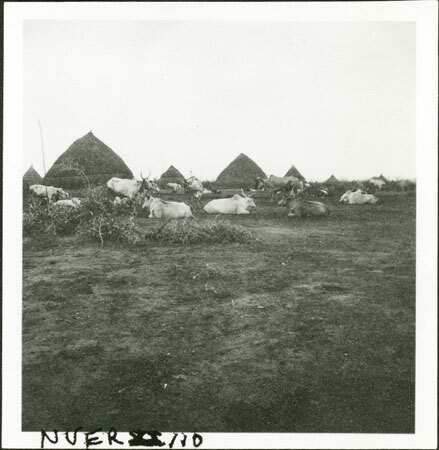 Looking towards cattle lying down in a kraal on raised ground with byres in the background, probably at Yakwach on the Sobat River, which Evans-Pritchard revisited in 1935. Evans-Pritchard notes that this visit to the village was in the rainy season and that away from the raised mound to the rear of the village the swamps after rain virtually isolated the site. Note on print border ms ink - "Nuer XI/10" & reverse ms pencil - "43 6 A105"
Morton, Chris. "Nuer homestead" Southern Sudan Project (in development). 03 Jan. 2006. Pitt Rivers Museum. <http://southernsudan.prm.ox.ac.uk/details/1998.355.503.2/>.